Skip The Bag: Our Chickens Have Pox! It's true, chickens can get pox. While not technically chicken pox, it is a related virus called avian pox. Our chickens started having spots on their comb and waddles. I searched black spots on chicken comb and got some options. The mites show upon the comb and on the body of the chicken itself. The black spots of mites look like tiny pin pricks of black on the comb. Our spots were bigger than that so I was able to quickly eliminate that as the culprit. Thank goodness cause I'm sure they are a pain to get rid of! The next possibility I read about was that it could be due to the girls figuring out their pecking order and attacking one another. I hadn't really see our girls be aggressive toward one another, and I saw it on several of them. None of the spots really looked like they were bleeding or scabs so I doubted it was this. This was the third thing mentioned that it could be. I immediately googled a picture and sure enough it's what my girls have. help fund this blog. The price to you remains unchanged. So what is Avian Pox? It is a viral infection called Avipoxvirus that is spread by mosquitoes, from bird to bird, or contact with contaminated food or water. Living in Florida I'm guessing my flock got them from a mosquito. 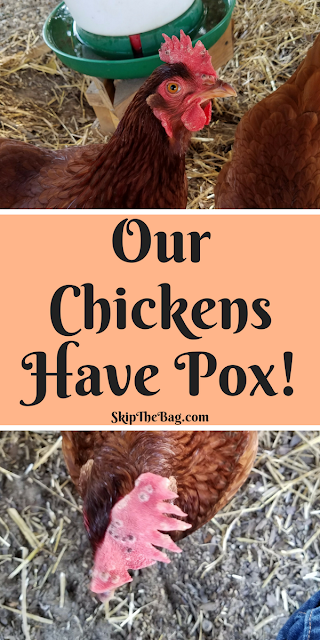 How can you prevent Avian Pox? There is a vaccine available. However once it gets in your flock it is too late for the vaccine. Besides we bought $3 chickens to have as pets and/or an egg source. We weren't going to pay for that. There appear to be two forms of the disease, a wet form and a dry form. The dry form seems to mainly affect the comb and waddle and is less serious. Blisters form in non-feathered parts of the birds, like the comb, the blisters rupture leading to the black scabs. The wet form affects the mouth and throat and can make it painful/difficult to eat, drink or breath. These, of course, are more serious effects which can lead to death. 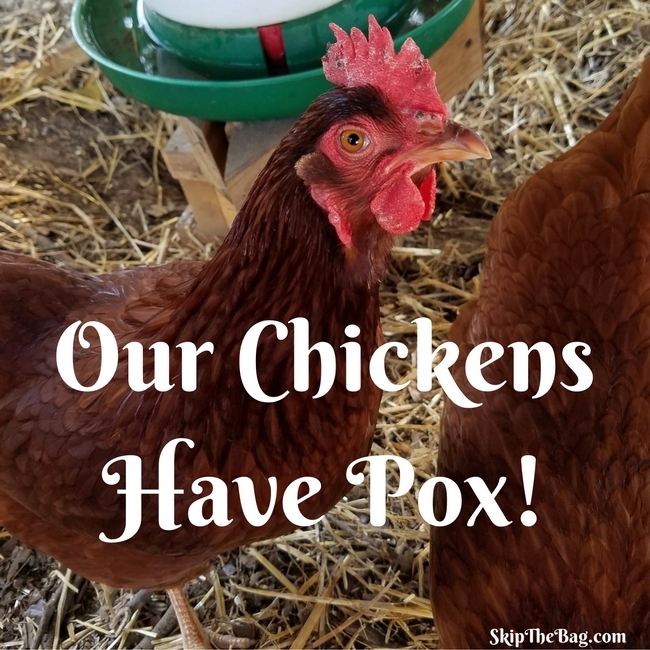 How do I treat Avian Pox? Unfortunately since it is a virus it just needs to run its course. If you have a chicken who is having difficulty eating or drinking you may need to get her to drink by getting a syringe full of water down her throat. Can humans catch avian pox? No, humans cannot get avian pox. The chickens are contagious to one another, but not to humans. 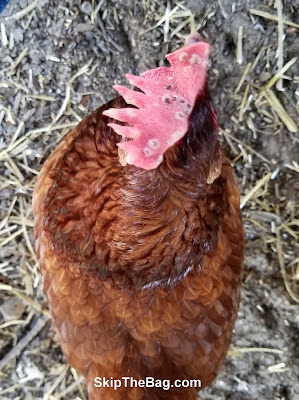 If you see a chicken with symptoms you could try and isolate her, but most likely it has already spread to others in the flock and they will begin to show symptoms themselves. Does Avian Pox affect the eggs? Chickens that are under stress, including illness, may not lay as many eggs. However, they eggs they do lay are perfectly fine to eat. Remember humans can't get avian pox. It takes roughly a month for it to make its way through one bird. Since it is spread slowly through the flock it may take a couple of months before everyone has healed. Fortunately ours healed up nicely and their egg production has bounced back. 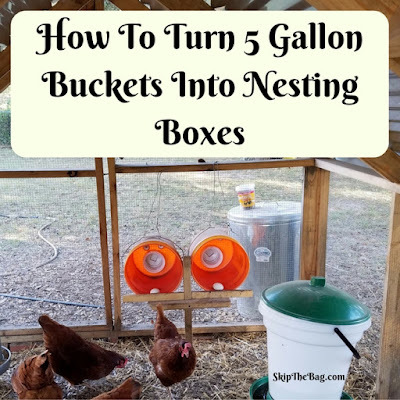 Don't forget to check out how we made their nesting boxes from 5 gallon buckets! Want to read more on Avian Pox? My goodness it really sounds like having chickens is a lot of hard work. They can have all sorts of health issues. 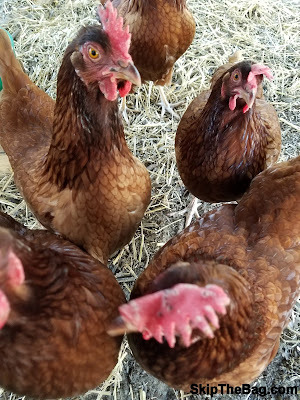 They peck at the eggs, the whole reason you bought them. They bring in mice and rats, which in turn brings snakes. They fight each other. Are they worth it? It's actually not too bad. They get roughly one egg a week (and produce 3-4 a day for us!). We haven't had any mice, rats or snakes or big fights. I definitely think it's been worth it!